For whatever reason, there's always a slight bit of embarrassment that comes with bestowing honors upon a Green Arrow comic book. It's really an unfair response; after all, Green Arrow has, with only a few exceptions, been graced with quality writing and superb art since it's inception at the hands of Kevin Smith and Phil Hester. Winick has been on the book for a long time now, and although he's had his share of difficulties in the form of a few awful fill-in artists (during the Infinite Crisis cross-over) and a horrendous cross-over with Green Lantern, Winick has done an excellent job of creating a comic that is regularly entertaining. He's got a skill for the kind of irreverent humor that is normally the domain of Millar and Ellis, and now that he's partnered with Scott McDaniel, an artist who has usually been in charge of books who's seriousness (or attempts at) far exceed his cartoonish style. McDaniel's career is one that the Factual has kept up with for some time now, and he's been too often shuffled around books that he had no business being on in the first place. His art is a youthful one, unlike the hyper-steroid art of the mid 90's and too far removed from the photo-realistic style that's currently in vogue. For whatever reason, he's never been hugely popular, although one doubts that he's not well known among artists. The latest issue of Green Arrow is yet another example of why the two creators shouldn't be separated anytime soon--a well-crafted issue detailing the always dork-popular team-up. As is per DC's usual wont, Batman shows up in Green Arrow's town, reminding everybody that being a billionaire means you can follow one's obsessions through the leisurely use of a private plane. 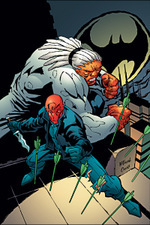 The current obsession Batman's after is, as the cover depicts, the Red Hood--otherwise known as the long-thought-dead 2nd Robin, Jason Todd. Winick was the last writer to do anything of importance with the Hood, and thankfully he ignores whatever adventures the kid has been doing since. (Although it'll never happen, someone at DC should ensure that Winick is always given approval over what Jason Todd is used for--no one else seems to have a good idea.) It would be a bit too intrusive to copy in all the dialog that pushed this issue to the top spot, it can be safely said that Judd Winick is writing some of the funniest banter short of The Office. In the end, although everything above can be said to be absolutely true, the simple fact remains that Green Arrow has, and will probably always remain, a B-grade superhero in a world where it's hard to have respect for the A-class. No kid, excepting a few random archery freaks, will ever want to grow up to become Arrow, and in the end, that's the acid test.